There are around 37 different species of cats. Some are considered small cats and others big cats. Most people are familiar with the big cats, such as lions and tigers. Among those regarded as small cats are the bobcat and the mountain lion. These cats live in the forests, semi-deserts, or swamps. Though quite similar in habitat, these felines have distinct characteristics. 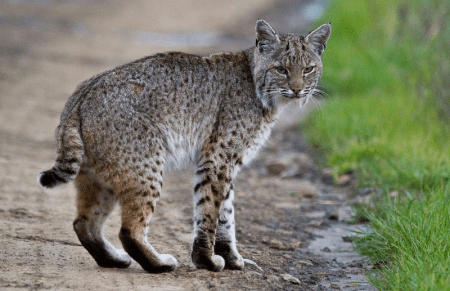 Continue reading this article to learn the difference between a bobcat and a mountain lion. Weighs around 11-35 lbs. Weighs around 66-187 lbs. A bobcat is also known as a wildcat or lynx. Its scientific name is Lynx rufus. There are about 12 identified subspecies of bobcats. The bobcat may live in the forest, suburban areas, semi-desert, and swamplands. This animal is around 2-4 feet long and can weigh anywhere from 11 to 35 lbs. Bobcats usually have a gray to brown coat and are characterized by a whiskered face and tufted ears. They have yellow eyes and their faces look wide because of the extended hairs. They also have black stripes on their front legs and a black-tipped, chubby tail. Bobcats are smaller than the Canada lynx but are about twice as big as house cats. Bobcats are predominantly nocturnal animals. They are territorial and live a solitary life. Their breeding period is from winter to spring and gestation takes about 2 months. Female bobcats usually raise their kittens in concealed burrows. Bobcats are equipped with keen sight and sharp hearing. They also have a good sense of smell. They are carnivores with a diet usually consisting of insects, mice, birds, chickens, geese, rabbits, and squirrels. True to their common name (wildcat), this feline is small but aggressive and can kill prey larger than itself, such as deer. However, the population of bobcats is threatened by certain animals such as the coyotes. The average life span of a bobcat is 10-12 years. A mountain lion is a feline of many names. 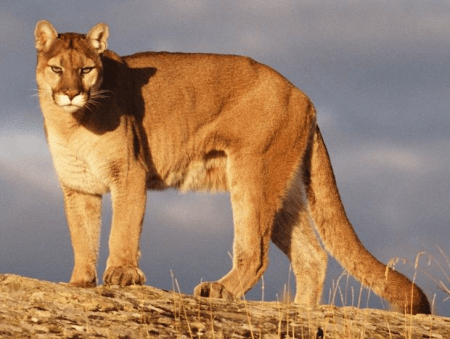 It is also known as the cougar, puma, panther, or catamount. Its scientific name is Puma concolor. It holds the Guinness world record for the animal that has the most number of names. At present, though, most scientists refer to the animal as “puma.” There are around 32 recorded subspecies of mountain lions. These animals usually live in wooded or suburban environments and even rocky and semi-desert areas. A mountain lion has a total length of up to 6 feet. It weighs around 66 to 187 lbs. It is a slender cat with a round head and ears that are erect. The mountain lion usually has an orange-brown or yellow-brown coat. Its tail is long and cylindrical and has a dark tip. Although the mountain lion is large, it is commonly associated with the small cats since it lacks the ability to roar. Nevertheless, it is identified as the second heaviest cat in America, next to the jaguar. Mountain lions are solitary, nocturnal animals and are also very territorial. These animals have no fixed mating season and the gestation period takes around 3 months. Only the female mountain lions take an active role in parenting and they are very protective of their young. Mountain lions are carnivorous. In catching their prey, they use both stealth and strength. They ambush their prey and can jump over 20 feet. Their diet consists mainly of deer but they also eat other animals such as the coyotes, porcupines, raccoons, jackrabbits, and squirrels. Mountain lion population is noted to be sustainable and managed sport hunting of the animal is still allowed. Their average lifespan in the wild is around 8-13 years. What is the difference between a bobcat and a mountain lion? A bobcat is smaller with a body length of about 2-4 feet, compared to mountain lions which grow up to 6 feet long. Bobcats are also much lighter, weighing around 11 to 35 pounds whereas mountain lions are heavy weighing around 66 to 187 pounds. These two cats also differ greatly in physical appearance. Bobcats have gray to brown coat, a whiskered face, and a black-tipped chubby tail. Mountain lions, on the other hand, have orange-brown to yellow-brown coat, a slender body, a rounded head, and a long, cylindrical dark-tipped tail.